They call themselves a "luxury tech accessory company for fashionistas," and that pretty much sums up Jagger Edge iPhone cases perfectly. The Flail Ring iPhone Case not only looks cool, it serves as a makeshift weapon for late night protection. It comes in a slew of rockerish leathers such as tangerine and leopard print with a ring grip of silver, gold or brass spike balls. Jagger Edge's Sophia iPhone Clutch Case is my favorite - lighten up with silver on white or keep it dark and chic with gold studs on black leather. 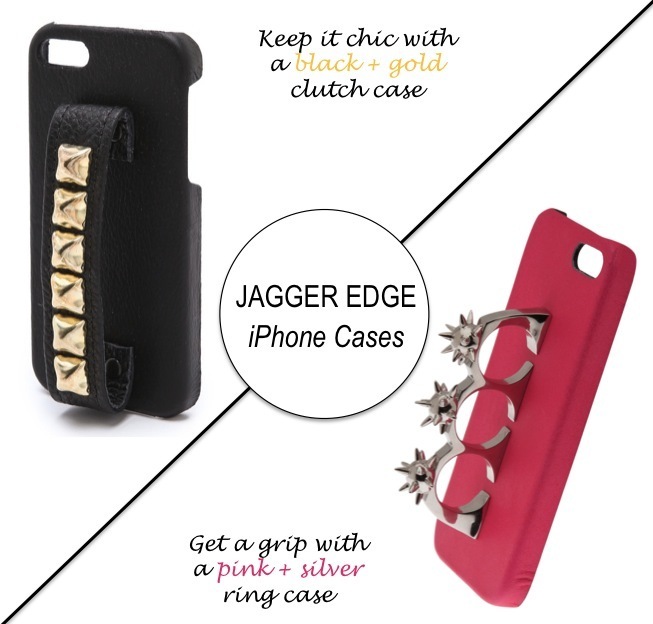 Shop more Jagger's Edge tech accessories here and here. These look really cool! Plus it would totally keep me from dropping my phone 208793485734 times a day. The pink one is really cool. Great idea!! I love the black one! I really like the studded black one. These are so unique! how cute are those cases? thanks for sharing! Love the red one more.